Our book, Rocks in the Water, Rocks in the Sun, is now available. You can order it here. We must acknowledge the determination with which AUP supported our book throughout the entire peer-review process. A little more about the book below. We intend to resume posting our reflections to this site. Joegodson will work on creating videos intended to help audiences outside of Haiti better understand what is happening inside of Haiti. His posts will be categorized as Blogs from Haiti. This will be a challenge for Joegodson who lives with Antonia and their two little children in the home he built in Canaan, outside of Port-au-Prince, after the earthquake. He has not been able to put a roof on the structure yet, but he assured that the foundation and the walls were well and securely built. (A tarp serves as the roof for the time being.) There is no electricity there. Money is scarce and is not related to how much work he does. So, posting video blogs is complicated. We will also post written and video blogs under the category of Blogs from Canada. Those will reflect Paul’s interests. Of course, as was the case with Rocks in the Water, Rocks in the Sun, all entries will be – to some extent – collaborations. But we are different people living in different worlds. At the same time, we are living within the same capitalist world system. Working together allows us to better see how it functions across borders, cultures, belief systems, and so on. 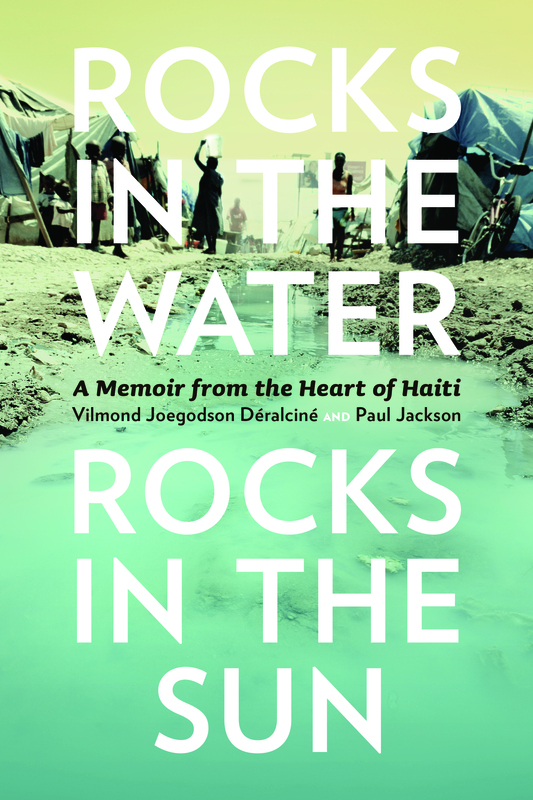 As for Rocks in the Water, Rocks in the Sun, we wrote the bulk of the book in Haiti in the fall of 2011 and into 2012. Paul wrote the afterword afterwards in Canada. We sacrificed a lot to write it and to get it into publication. It is a rare collaboration. Rocks will be invaluable reading for adolescents and youths who live in the English-speaking world (rather, who read English). Joegodson and his family and friends describe their lives in intimate detail, from his childhood to his life as a young father after the earthquake. It is powerful reading. Joegodson describes with humble insight the time he spent inside of MINUSTAH, the United Nations police force that controls the poor of Haiti in favour of the rich – inside and outside of Haiti – who exploit them. Teachers and parents who want their children to understand how life is lived in the slums of Haiti (or the Global South more generally) should make sure they make a copy of Rocks available, and then discuss it with them. The afterword addresses the economic and political history that has led to the social conditions that Joegodson describes so masterfully (Paul writes this sentence). It frames the details of that history in terms of the confusion over the meaning of democracy: the word and the historical reality. Why would poor Haitians willingly accept the role that the capitalist world system assigns to them? Heart of Haiti by Joegodson Déralciné and Paul Jackson is licensed under a Creative Commons Attribution 3.0 Unported License. Permissions beyond the scope of this license may be available at www.heartofhaiti.wordpress.com.